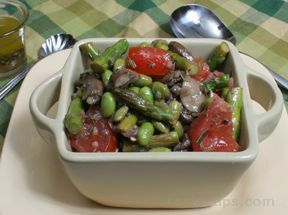 Serve this great tasting recipe as a vegetable side dish or a delicious salad alternative to the usual lettuce garden salad. Combine in jar with a tight lid and shake well. Add red onion and the shallot. SautÃ© for 5 minutes. Add mushrooms and chopped garlic. Continue stirring and sautÃ©ing for another 5-8 minutes until mushrooms are golden brown. Add asparagus, rosemary, and lemon juice. SautÃ© another 5 minutes, just until asparagus is crisp tender. Add in edamame. SautÃ© 2 more minutes. Turn off heat, add chopped tomatoes, salt and pepper. Pour vinaigrette over vegetables, note you may not need to use all of it. Serve warm with Herb Grilled Chicken.